seedEnergy established Eucalyptus cladocalyx trials at Mount Gambier in South Australia, Deans Marsh and Carisbrook in Victoria during 2002 and 2003 with the aim of developing high quality seedling seed orchards for plantation saw-log production. The trials were measured at ages 4 to 6 years. In 2009 genetic evaluations were undertaken and the results used to cull each trial to a population of genetically superior trees for seed production. 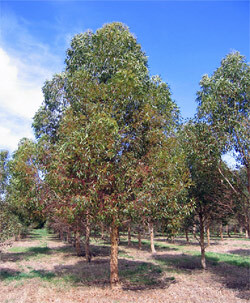 seedEnergy's Eucalyptus cladocalyx trial at 'Goodwood', Mt Gambier in 2009. The trials comprised 54 plus tree phenotypes for growth and stem form selected from the best performing natural populations (Wirrabara and Flinders Chase) and planted stands (Lismore, Vic.) of E. cladocalyx. The trials were established as resolvable block designs with 21 (Carisbrook) to 25 (Mt Gambier and Deans Marsh) replicates of single tree plots. The trials were assessed for diameter at age 4 years (Mt Gambier and Carisbrook) and age 6 years (Deans Marsh). The Deans Marsh trial was assessed for stem form and forking at age six years. Genetic evaluations based on growth and stem form were carried out in 2009. The results were used to convert the trials to seedling seed orchards by culling the inferior trees at each site and retaining the best trees for seed production. Seed has been harvested from elite orchards trees since 2009. seedEnergy has a large stock of E. cladocalyx seed available.